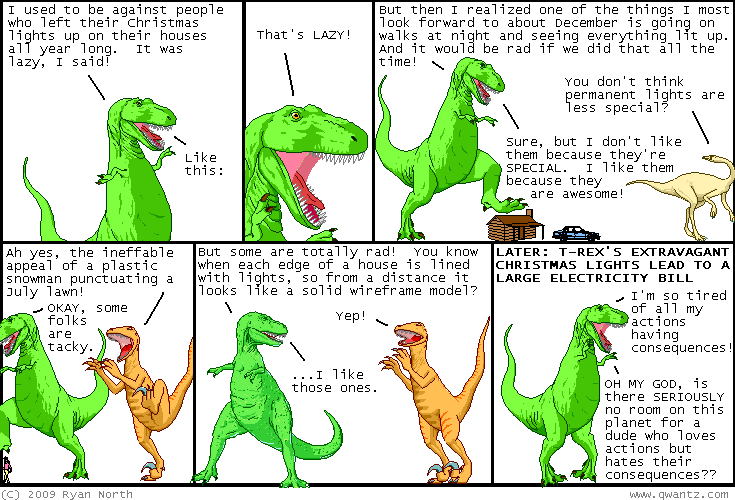 Dinosaur Comics - November 18th, 2009 - awesome fun times! –Make me an enemy in a video game and you'll sell a million copies! November 18th, 2009: If you missed my Reflections | Projections talk, the tastefully-titled "GUYS, LOOKS LIKE IT'S WACKY TIME", and you still want to see it, then I've got some good news for you: the videos of all the talks are now online! Might I recommend... these rad greeting cards? One year ago today: "I had my first dream of flying and it was GREAT. I flew over cities, towns AND rivers"